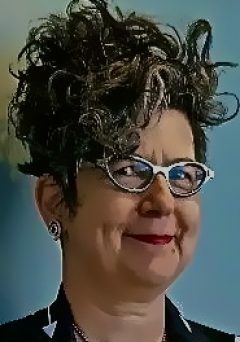 I had a most unsettling experience in my hometown a few days ago. It made me think spring really ought to hurry up and get here because my imagination might be showing signs of freezer burn. It was an episode which brought to mind the scene in the TheWizard of Oz, where Dorothy isn’t quite certain at first, but then, yes, that tree really did lob an apple past her head. 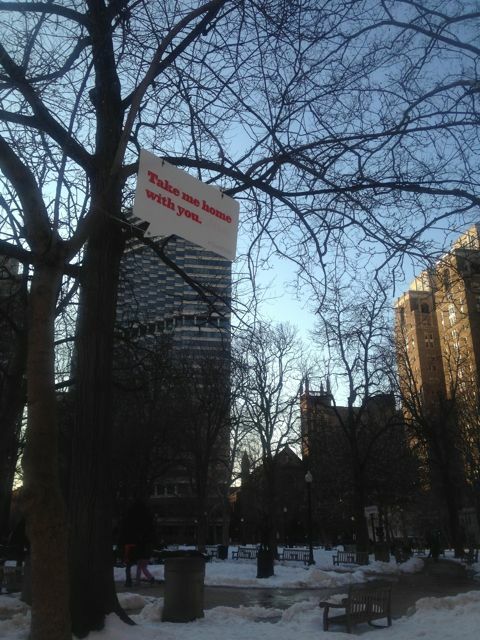 So there I was, at dusk, walking through a snowy, thawing Rittenhouse Square, and I had the oddest sensation that someone or something whispered to me as I passed. Yet there was absolutely no-one in sight. Moments later, a few yards into the park, I whipped around when I could have sworn I heard another, murmered comment, but again, no-one anywhere in the vicinity. It was starting to get dark, so I noticed the flash of a bright, white, foam-core board, suspended from the trunk of the tree just in front of me, just above my head. 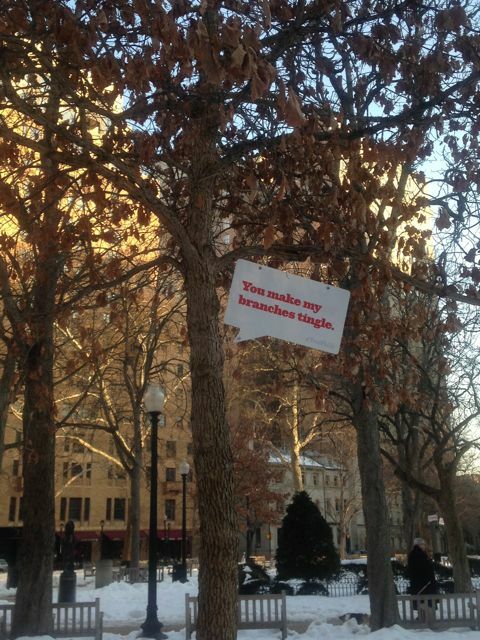 I looked up and read the words I then recognized the tree had been mumbling, “Let’s Make Arborly Love.” Only then did I see that there were a few dozen of the white speech bubbles, emerging from trees all over Rittenhouse Square. I retraced my steps to give Tree #1 a second chance. I hadn’t been imagining it at all! I’d walked right by, and almost missed, being told that I made that (kinda cute) tree’s “branches tingle”. Other tree comments included, “I’m nuts about you,” “My roots run deep, my love runs deeper,” “You can nest in me any day” and, as I got to the perimeter of the park, one of the trees beckoned me, “Take me home with you.” I thoroughly enjoyed my reverie, thinking I had happened upon the most marvelous installation of conceptual art, because as everyone knows, Philadelphia has actually always been the real center of the art world. 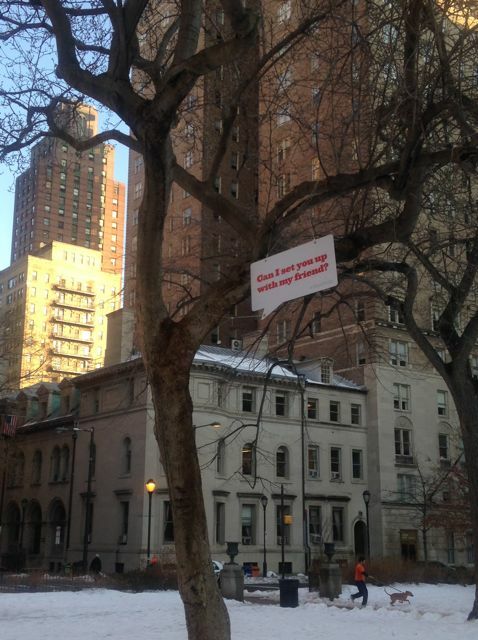 Actually, the installation is a fabulous initiative called TreePhilly, a program of Philadelphia Parks and Recreation partnering with the Fairmount Park Concervancy. 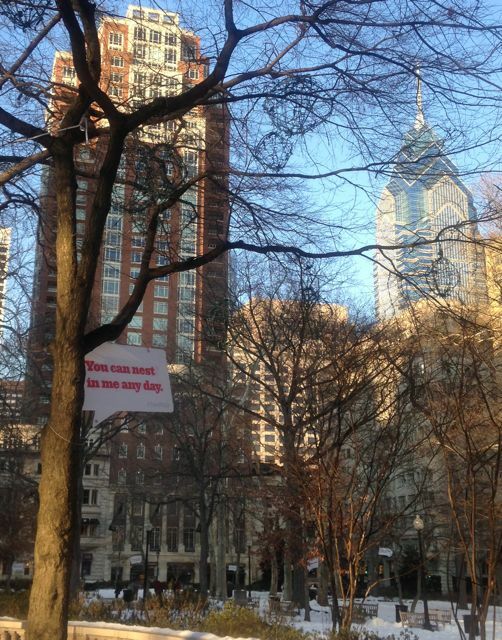 TreePhilly connects Philadelphia residents with the resources they need to plant and care for trees and grow our urban forest. 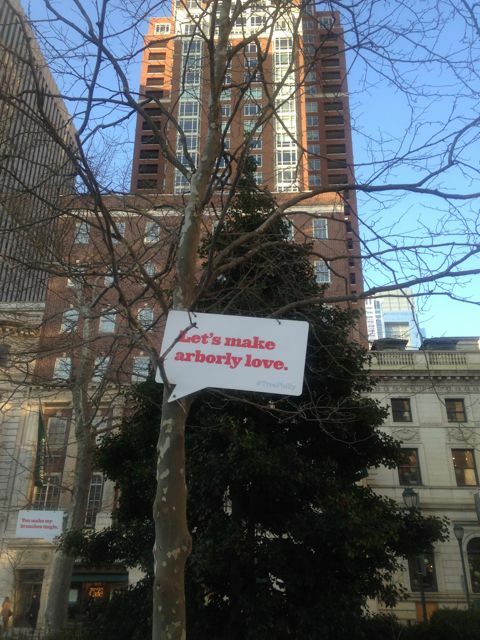 TreePhilly’s kickoff was Thursday February 20th in Love Park. Those in attendance had an opportunity to hear the Mayor speak and the “spokes-trees” tell us how much they love us. You sure can go home again. Thanks for posting. Now I’m a little homesick for snowy Rittenhouse Square since we’re living in Honolulu until May — the operative adjective being “little”. 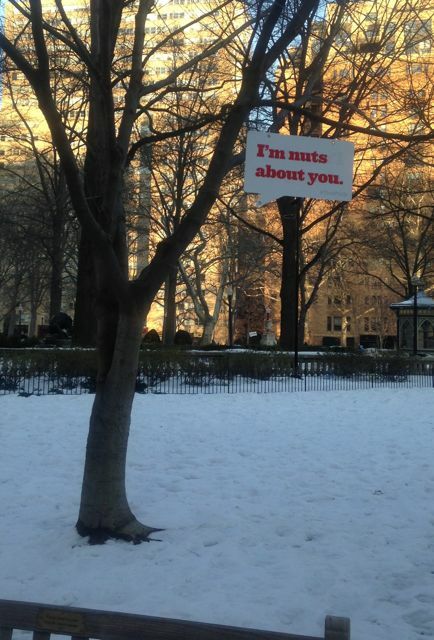 When I was growing up I always thought Rittenhouse Square was so elegant, sophisticated and beautiful. Now that I’ve seen a lot of the world and its plazas and squares, I still find Rittenhouse Square to be one of the most beautiful and pleasing urban spaces. 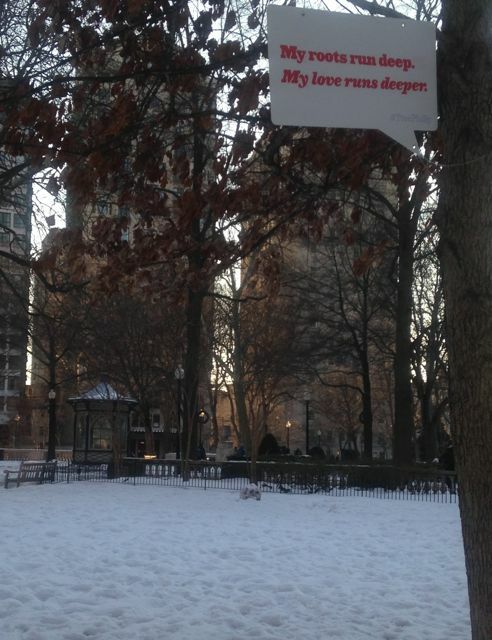 Love Rittenhouse Square. What a new way to listen/look at the square. Will take those imagines with me on my next walk through the park. Thank you for sharing!